Daniel “Doc” O’Connor is the Chief of Academics, Executive Chef, and founding member of the School of Gastronomy at the La Universidad Tecnológica Centroamericana (UNITEC) in Honduras, a Laureate International University. Daniel is a partner and Managing Director of Aesterion Hospitality Partners, a Transaction and Advisory firm specializing in Hospitality, Tourism, and Mixed-Use Development in the Caribbean and Latin America. 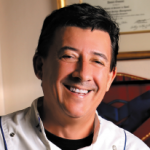 An accomplished professional chef and author of the “Bay Island Cookbook,” Daniel is a graduate of the Culinary Institute of America and holds a master´s degree from Florida International University in Hotel and Food Service Administration. Daniel joined the JustWorld Board of Directors in 2008. Daniel has organized special dinners with his university to benefit Asociacion Compartir, the JustWorld partner project in Honduras. Daniel has supported a number of nonprofits in Honduras including Angelworks, a JustWorld partner project from 2006-2012.